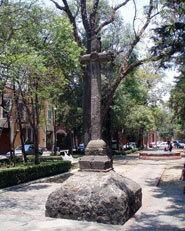 I’ve found two beautiful XVI century atrial crosses in Mexico city well worth talking about. What I find most fascinating about them, are their stone-carved indigenous feathers. Both crosses are located in the south-west part of Mexico city; back in the XVI century, an area quite close to the water’s edge. Atrial crosses are a distinctive element of Mexican colonial architecture. They served two main purposes; first, to provide a tangible axis-mundi and a central point in the church, and secondly, to function as a visual and moral guide to Christ’s passion and crucifixion. Not surprisingly, most atrial crosses display images related to these, such as the coins paid to Judas, the ladder used to take Jesus down, the nails, the crown of thorns, even the dice Roman soldiers were playing with at the foot of the cross! Our first atrial cross is hidden away in a very small closed plaza in what used to be the town of Chimalistac. 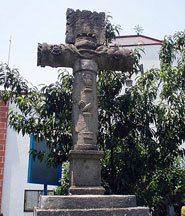 This cross belongs to a tiny XVI century chapel, which nowadays is quite proud to be able to call itself the “parish” of San Sebastián Mártir. For years I’ve bought books in the library just behind that plaza and, although I’d visited it a few times, it was only recently during a Sunday stroll with my husband that I came to notice its beautiful and distinctly indigenous features. 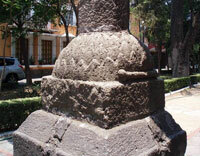 The cross is placed on top of a sphere covered in stone carved with pointy, eagle-like feathers. Amazing! Just before my eyes was a precious testimony to some unknown indigenous hands successfully struggling to adapt the old, beloved ways into the new ones. This artist, whoever he was, transformed this particular piece of stone, which was probably intended to be a very Christian and European sign, into something completely different; a subtle expression of a dawning way of understanding life. Seen in this new light, I couldn’t help but feel very moved as I admired the cross. I’m no authority, but from what I’ve read, I think I can more or less safely assume that in this case those feathers express the idea that the cross is a precious object. Feathers were highly esteemed items in prehispanic times; only nobles of the highest ranks were allowed to wear them at will! Feathers were a metaphor for things that were precious, beautiful and divine. Feathers belonged to birds, and birds were able to soar up to the sky linking themselves with heaven’s layers. The eagle was particularity related to a major deity: the sun, and newly converted indians in the XVI century had no problem relating the figure of Jesus to their solar deities. 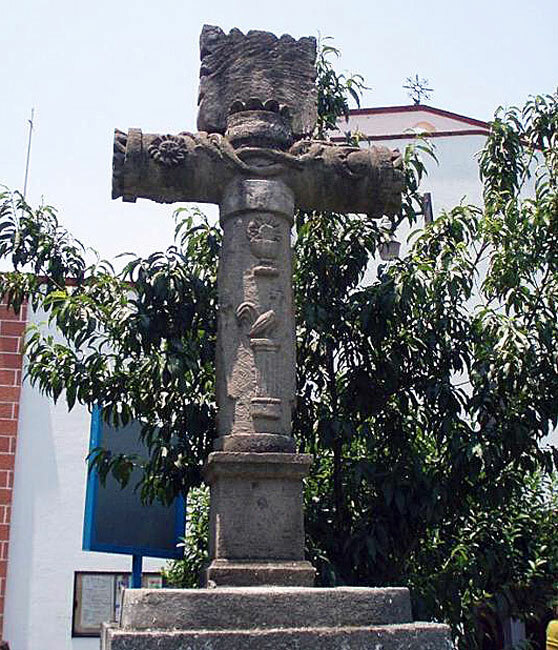 The second cross belongs to Tlacoquemécatl’s church, located in Colonia del Valle, just a couple blocks away from my grandparents’ house. 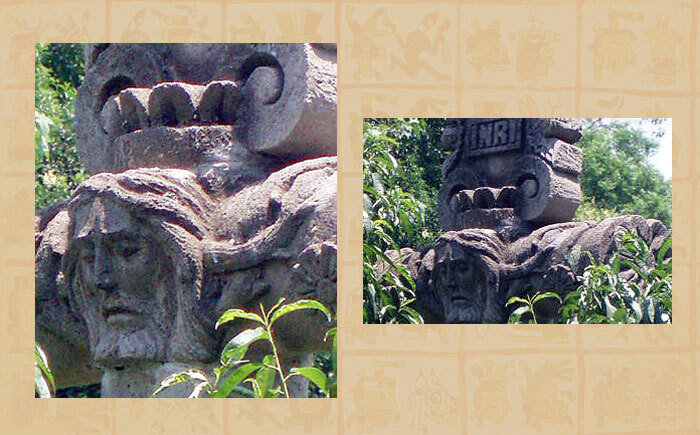 Colonia del Valle is also located in what would have been dry land on the south-western shore of the lake, not far away from Coyoacán and Mixcoac. Tlacoquemécatl’s cross is no exception to the moral instruction program I was talking about; there you have the usual crucifixion images displayed on its back, but there’s a simply extraordinary element that makes it a completely unique piece. Even Mom and grandpa were surprised that day when I pointed out how funny the Christ looked wearing an indigenous feather crown!!! Mexicolore writes: What do others think? Do you see a subtly crafted feather crown? Flowers? Some other element? NOTE: For further information on this topic of a solid academic kind, read Chapter 5 (‘The Cosmic Tree’) in Jaime Lara’s City, Temple, Stage (University of Notre Dame, Indiana, 2004). 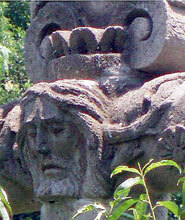 On the bottom cross, I think I see a native Mexican flower next to Jesus. Also, not sure if that’s suppose to be a vein or not, but it looks like a water symbol coming out of his ear.